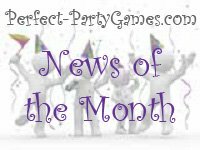 Summary: TryiNews of the Month is a game where you match the news headline to the month in which it happened. Find three news headlines for each month of the past year. It can be local, state, national or international news. Mix up the headlines you found and read them to the players one at a time. All the players have to do is list the headline under the correct month in which it happened. Winner: The player with the most correct answers wins the game.